Rochester, NY – April 10, 2019 – Power Management was recognized as the No. 1 Trade Ally in NYSEG & RG&E utility territories for energy savings in 2018. As a Trade Ally for the utilities, Power Management develops and implements energy efficiency projects throughout New York State. Since the program started 6 years ago, Power Management has been a registered trade ally and prolific contributor to the energy efficiency rebate program. The NYSEG and RG&E lighting rebate programs offer substantial cash incentives for commercial and industrial customers to switch to energy efficient lighting systems. Power Management’s approach is a comprehensive development strategy, including the coordination and completion of all available incentive applications, scheduling of both pre/post inspections, proposal creation and review, and onsite project management through completion of the project. With extensive experience managing lighting retrofits across the U.S., lighting specialists design a comprehensive solution that outlines the detailed project scope, projected annual savings and ROI, along with all available financial rebates and incentive opportunities. 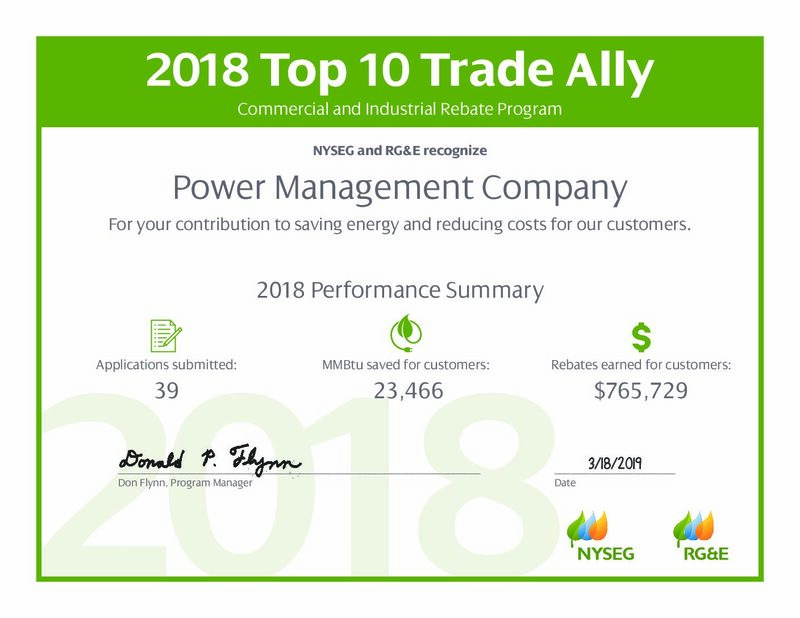 This relationship and status as a Trade Ally with NYSEG and RG&E, allows Power Management to help customers attain incentives and rebates that can offset the cost of energy upgrade projects. In 2018, Power Management submitted 39 applications on behalf of clients to the program. This equated to over $750,000 in rebate money being awarded to Power Management clients. Clients benefited from an energy savings of 23,466 MMBtu, equivalent to over 6.8 million kWh saved. If your company is interested in learning more about energy efficiency projects and if you could benefit from this type of opportunity, please contact Power Management.